New York, New York — Alright, I’ve heard enough, I’ve seen enough, I’ve talked to all the players. And here’s the deal, they don’t have a prayer. Maybe in a best case scenario I might not wish it so, because I like close competitions, but Geoffrey Mutai is your winner of the ING New York City Marathon for 2013 right now. And that’s from someone who has never been much of a predictor. But it is what it is as surely as Al Salazar was the winner before the gun in 1981 – “my goal is to run 2:08 and to win.” So if you find someone that wants to take the field, take Mutai and put whatever money you have on him. That’s the kind of form he’s on, and what I think of his chances. Now all he has to do is pull it off. With London Marathon champion Tsegay Kebede and World Champion Stephen Kiprotich caught up in the World Marathon Majors drama and the $500,000 that goes with the series win, will either of them take the risk of trying to match a fully blooded Geoffrey Mutai for a chance at the $100,000 first place check? Not likely. In fact, Kebede has come right out and said in a race with 48,000 starters he’s only racing one man, Kiprotich. Since Kebede only has to finish second and beat Kiprotich to secure the World Marathon Majors jackpot, you know he isn’t following Mutai into the danger zone. 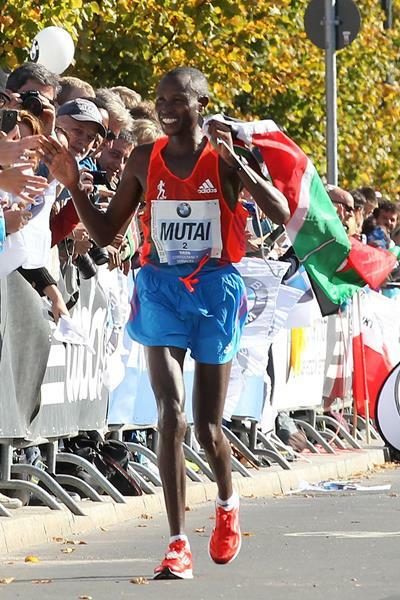 In 2011 Emmanuel Mutai won the WMM title by being similarly cautious and letting Mutai go in the final 10K in New York. His second place finish wrapped up the half-million dollar prize then. For his part Stephen Kiprotich has a much sterner task. The World and Olympic champion from Uganda is 15 points behind Kebed in the WMM standings. Essentially, he has to win the race to take the $500,000 title. But how to manage that? Perhaps his best chance is to egg Mutai on and hope he dies so Stephen can pick up the pieces in front of Kebede. But going head-to-head seems suicidal, especially since Kiprotich and Kebede both ran the World Championships Marathon in Moscow in August, and Mutai didn’t. But it’s Mutai himself that has me crawling out here on this limb. I’ve seen athletes in top form coming into a race before, and this guy has the look. Even his cryptic Kenyan way of saying very little belies a man in full confidence of his preparation and chances. His big confidence, of course, comes from an excellent build up phase sharpening his blade against Wilson Kipsang the newly minted marathon world record holder in Berlin and Dennis Kimetto who broke the Chicago Marathon course record two weeks ago. Each of the three men is managed by Gerard van de Veen of Volare Sports. And Gerard says that Geoffrey (pronounced Jaw-free) was the front runner of that training group, and is now very stimulated by what his mates did in their recent performances. New York, like Boston, is not a paced race, nor is it flat like Berlin and Chicago. There have been 33 sub-2:05 performances in record-legal marathon history, every one of them on flat, paced courses ( 10 in Dubai, 9 in Berlin, 6 in London, 4 in Chicago, 2 each in London and Frankfurt). 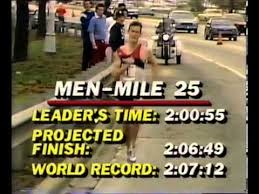 Geoffrey’s 2:05:06 is the fastest ever run not in one of those venues (given that the 2011 Boston times of 2:03:02, 2:03:06, 2:04:55 and 2:04:58 don’t count for point-to-point and downhill reasons). But with no pacers to drag them out, we’ve seen a pack of athletes look around in search of a lead dog before, and if not finding one, settle into a tactical race. So I asked Geoffrey, what if nobody goes out and takes the pace. Will you? The fastest half-way split in New York history came in 1983 when Tanzania’s Gidemas Shahanga passed over the Pulaski Bridge in 63:12. That was the year New Zealand’s Rod Dixon ran down England’s Geoff Smith in the final 365 yards in one of New York’s most iconic competitions. This year, given the weather, Mutai may go even faster. When asked what the perfect pace would be on this course he came right out and told us his plan. 2:04:30 in New York City??? But in his record year he closed the second half in 1:01:50, one of the fastest second halves in marathon history, and 28:43 for the last 10K, winning by 1:22 over Emmanuel Mutai. The man is not risk averse. On that cool gray morning Jonesy ran away from the two rabbits in the first two miles, going 1:01:42 for the first half, at the time it was the eighth fastest half marathon in history. He finished in 2:07:13, one agonizing second off Carlos Lopes world record from Rotterdam that spring. But what balls that Jonesy had. Mutai might need a similarly sized jock on Sunday. His place in history is secure. He has all the money he will ever need. If there were ever a time to take a flyer, this is it. It’s going to be something to see, you can be sure. Nobody could in 2011, and I just don’t think anyone can now. 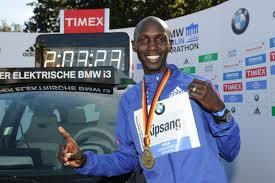 Maybe 2012 Paris Marathon course record holder Stanley Biwott is the best bet. He pressed the pace in London this spring at 21 miles, before fading to eighth place. Stanley’s a gamer. I’d almost pay to see him try. What fun that would be. But Stanley has a habit of going hard and fading late. Maybe his former training partner Martin Lel, the 2003 & 2007 NYC champion may have another good one in his pocket, but at age 35 what are the chances? We haven’t seen someone go for broke in New York City since El Mouaziz of Morocco took off at halfway in 2000, and cruised to a 2:10:09 win, 2:21 ahead of Japhet Kosgei of Kenya. Last year it was Hurricane Sandy that shut down the race and the city. This year if Geoffrey Mutai blows through the five boroughs in sub-2:05 we might as well close down the race for good. I know I’ll have seen enough. Want to bet? Great call. Others predicted Mutai of course, but none so definitively.